SUPERB LITTER OF OLD ENGLISH BULLDOG PUPPIES. 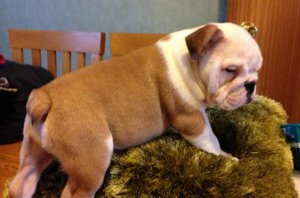 Our bulldog puppies retain the classic old bulldog look and characteristics (short, stocky, wide, nice bulldog head) with the added bonus of rare colours. our puppies are bred and raised to suit family/pet lives and will be well socialized. both parents are free from any health issues and are family pets and can be seen. Both mum and dad of this litter have absolutely superb temperaments, loving, loyal, obediant and gentle.